Yes, the flat top haircuts is a classic style that has stood the test of time. Flat tops has been around since the 90’s hip hop era and was even featured in the movie Fresh Prince of Bel Air. It is also a popular military haircut. A simple flat top may seem boring, but recently they has been several upgrades from the boring and bland flat top. With modern alterations to the flat top haircut, you now have several styles to choose from. The different styles which has evolved since the inception of the haircut has made it adaptive to the modern needs of men. You can find within this article some of the best flat top haircuts for men. A flat top haircut is achieved by trimming the sides and back hairs while the top is maintained. The hair on the top of the head can either be long, short or medium. Also for the back and side hairs, you can go with the different types of fades such as skin or taper. A high fade does the trick for most people. You can check out our article on high fade haircuts here. The remaining hair on the top of the head is then shaped either straight up or angled in the shape of a cone base. Finally, after the sides have been shaped up the top is then leveled. 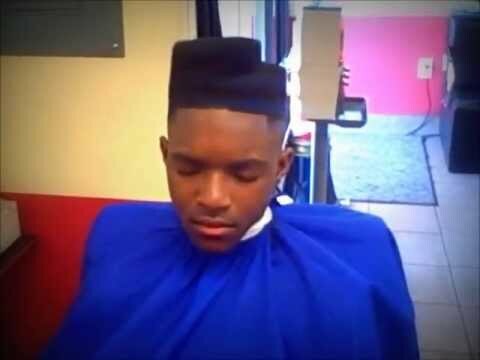 Some flat top haircuts have the appearance of a box and is referred to as “box haircut”. Despite its simple appearance, a flat top haircut is not so easy to achieve. This is especially true for flat tops with very long hair. Your barber needs to skillfully shape the hair after drying. It also requires a keen eye sight to achieve the perfect lines and shape. A little mistake you could get the whole thing wrong. This should be avoided because it is difficult to correct any mistake while shaping up the hair. Let us begin our list with the military flat top which is one of the simplest forms of the flat top. The military flat top sometimes called the high and tight. It consist of a short well trimmed hair on top of the head combined with a bald high fade or taper fade. This is gives a very neat appearance, which is obviously one reason why it is favored among the military elites. This haircut requires very little maintenance and has no additional flair. It is simply bland. Another style which is popular especially among die hard fans of the 90’s era is a high flat top combined with a bald fade. Adding a bald fade to this classic haircut spices things up a bit. The hairline is often very sharp and accentuated when combined with the bald fade. This haircut is common among athletes and artist or hip hop fans. The high fade is sometimes made more outstanding by dyeing with a different color. This will be discussed later on in this article. 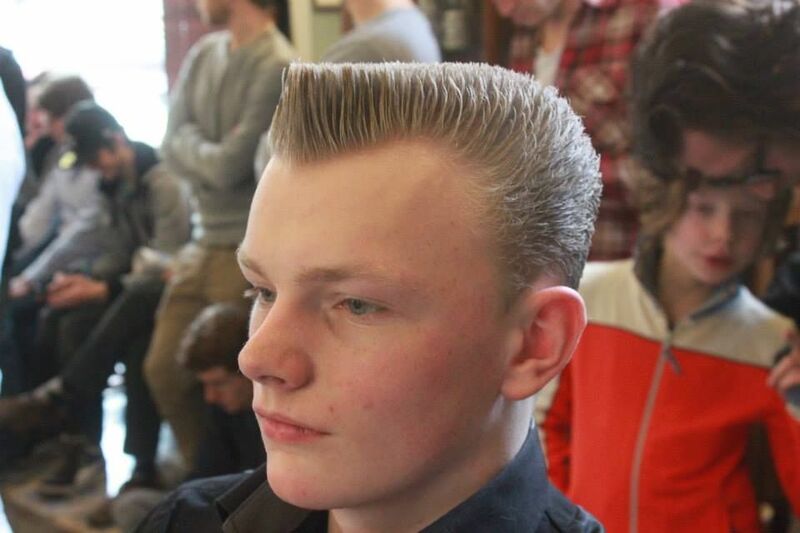 One of the trending flat top combinations is with the taper fade. Unlike the bald or skin fade, the taper fade is less edgy and more adaptable. For a more formal look , the taper fade and rockabilly or short flat top will go nicely. This however are not the only applicable areas. The versatility of the taper fade allows it to fit into most of the flat top haircuts. A medium flat top stands in-between the high flat top and the classic military short flat top. 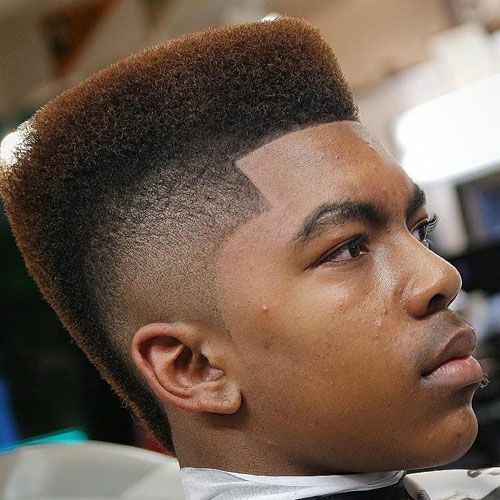 Simplified, it is neither too high or too low and is the most popular type of flat tops. 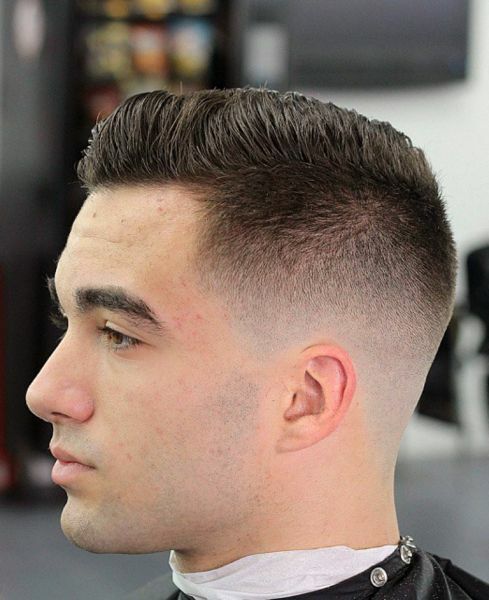 This haircut goes well with a skin or taper fade and a sharp hairline. For those with curly hairs or who simply like the look of one, this is for you. The curly flat top does not carry the rebellious connotation which is typical of the high top with bald fade. The curly flat top can be achieved in two ways, first by simply shaping up naturally curly hair into a high top or by carefully styling the hair on top using special gels to achieve the same curly effect. Curly flat tops are combined with a taper fade to give a mild appearance. This hairstyle is suitable for both formal and informal appearances. This is similar to the typical high flat top except that the styling is taken up a notch. Instead of the sharp edges at the top, you have a smooth slightly rounded edges. All your barber has to do is make the edges a bit smoother. The hair on top of the head should be of medium length for a perfect fit.This hairstyle is mostly combined with a taper fade and side part. With naturally curled hairs you don’t need any special gel to achieve this style. This hairstyle is definitely not what you see everyday but be rest assured it has a fan base of its own. Without seeing it before, this haircut is hard to comprehend exactly what the steps look like. Simply put, this is a high flat top with one side of the hair reduced in height. For this to be possible, the hair on top of the head has to be considerably long. This haircut requires a level of skillfulness, because any little mistake would be difficult to correct and still maintain the style. It can be combined with a taper of skin fade for more effect. The are different iterations to this haircut which gives you more options. 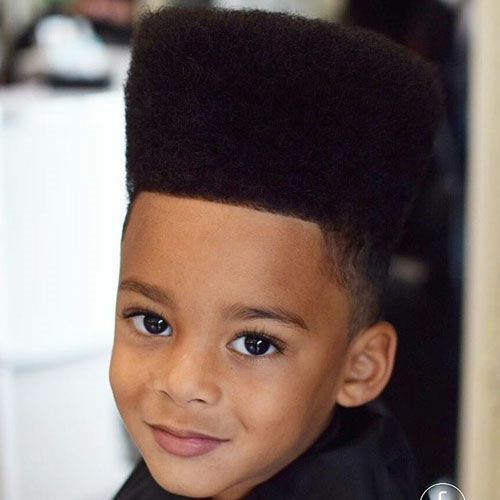 Now this is a contemporary representation of the classic flat top hairstyle. It is suitable for a more casual but sophisticated look. The haircut has the usual flat top with a taper fade. However, there are different designs cut out on the fade. Also, it is more fitting to use the rounded edge flat top even though a box edge or angular flat top will do just fine. 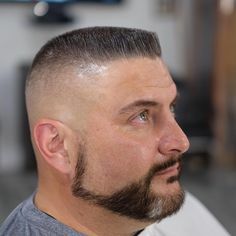 This haircut also features a sharp hairline which is perfect if matched with a beard. The angled flat top as the name implies, has a conical appearance. The base of the hair is smaller than the top which makes it look like a cone base. To make this look possible, the hair on the top must be considerably long. Most people who love this style often matches it with the high bald fade for emphasis. 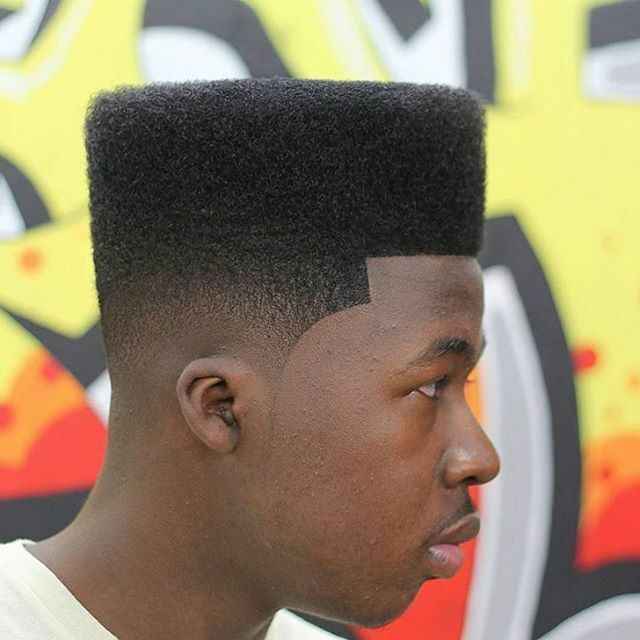 The angular flat top is one of the oldest forms of flat tops and has its root in the 90’s hip hop era. 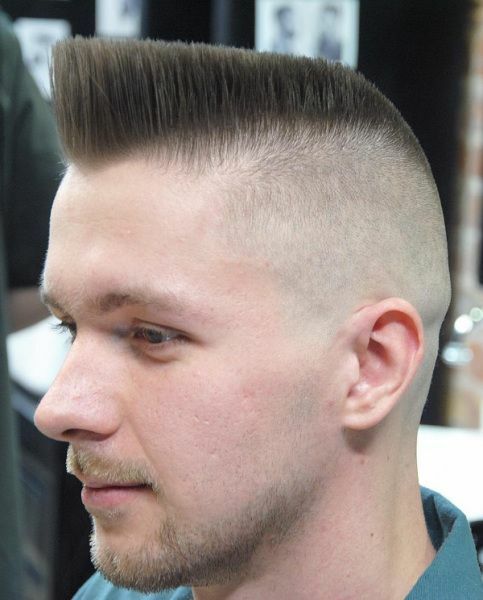 A part on either side of the head would give an extra sense if style a typical flat top. Parting can be used with any type of flat top without looking out of place. A part is simply a straight line cut through the hair on either sides of the head. Usually, parting is done just below the bulk of hair where the fading starts. A remarkable difference between this and the simple line up is that, the side part has a generous amount of hair after the line. This should not be confused with the side part. A simple line up is a carved into the side of the hair just above the fade. Unlike the side part, the line is often carved on the faded portion of the hair. This makes it more conspicuous and most lines are introduced with several other designs like the steps or dye. This is a matter of choice and personal style. After you have achieved your desired flat top haircut, you can choose to dye the hair on top. They are several dyeing options available which your barber should provide. Depending on the type of flat top you choose, this is an easy hairstyle to maintain. Most often the dye is applied once and you are good to go. A typical flat top haircut is stylish on its own but combine it with a burst fade and you are taking it to a whole new level. The burst fade is entails fading that goes around the ear all the way down to the nape of the neck. The hair at the back of the head is left long enough to blend in with the one on top. Unlike a Mohawk hairstyle, in a burst fade, the hair at the back is mostly not of the same length as that on top. This gives the impression of a slight slope from the top of the head down to the nape of the neck. A flat top with a boogie is a complex haircut that requires a level of skill to achieve. It replicates the burst fade but with little additions of its own. Similar to the burst fade, you will need to fade the hair around the ear and drop along the sides to the nape of the neck. However, to achieve the boogie, the faded hairs around the ears and sides of the head are not very low. These should be long enough to be blown or brushed backwards. It is sometimes called flat top with fenders. This haircut will also require a little maintenance. The buzz cut simply implies trimming the hair low using an electric clipper. While this is a trending haircut on its own, some people tend to combine it with several other styles. Although most buzz cuts features a small hair on top o the head, maintaining a flat top can be done. keeping the head on top long enough to get a reasonable flat top, the sides and back are buzzed down. You can add a line or part for extra effect. 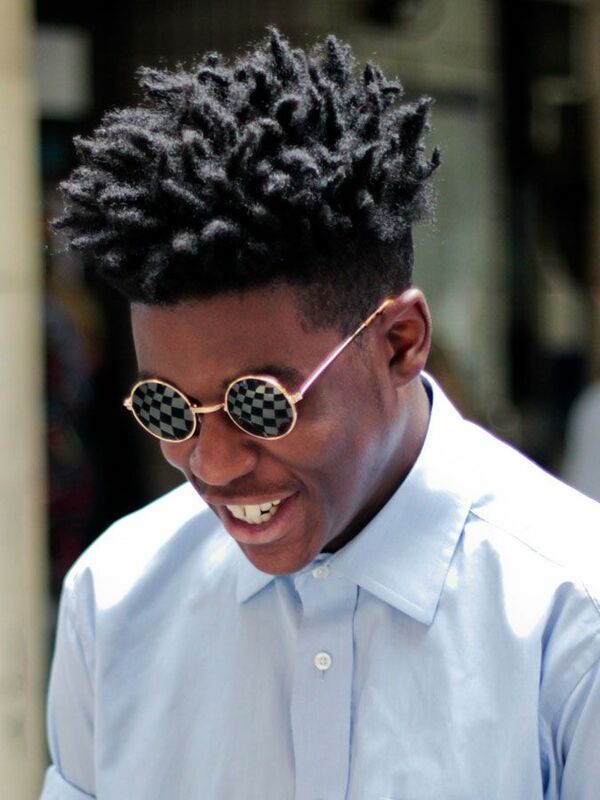 Instead of just your natural hair, you can decide to use a dread and maintain a flat top. All this requires is a short dread which will be leveled at the top. Once it is set in place, the haircut is easy to maintain and requires no additional care. However, it should be noted that the hair on top of the head should be of medium length or a little bit lower. This is because if they are too long the dreads will be too heavy to maintain a vertical appearance once it is too long. The rockabilly hairstyle is a modern combination of the pompadour and the flat top haircut. An exaggerated hairstyle with a bit of edginess, this is a perfect haircut for a classic look. One of the most prominent feature of this haircut is the extended front hair. This gives it the look of the classical pomp. However, the top of the hair is flattened out and the back ends in a curve. Both sides of the hair is shaped to reflect the box look of the flat top. It is a fairly complex hairstyle that is which requires a moderate amount of skill to achieve. As the name suggest, this flat top has a distinguished appearance. It is an excellent classic look with lots of details. The straight hair is achieved using hair gels which are applied after the shape has been cut out. The hair is then combed to make it straight. At the top, care must be taken to level the hair. You can combine this with either a buzz or taper fade for more details. Rocking a beard with the usual flat top shows a sense of personal style. You can choose from any of the different types of flat tops. For a perfect fit, a shorter length flat top will be better than a high flat top. This is then lined such that it matches the lining of your beard. Any design can be used with this haircut for a more edgy look. When rocking a beard, make sure you request for a taper fade so that the line up will sow perfectly. 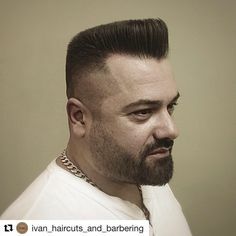 This haircut features a slight departure from the usual flat top. The word slanting is used due to the fact that the hair is cut in a way that makes on side longer than the other thus forming a slope. It can either be made to slant from the front to the back, or from either left hand-side or right hand-side to the other. Most barbers will include a part on the side with the lower hair. You can opt for a taper fade or buzz fade as both will do just fine. 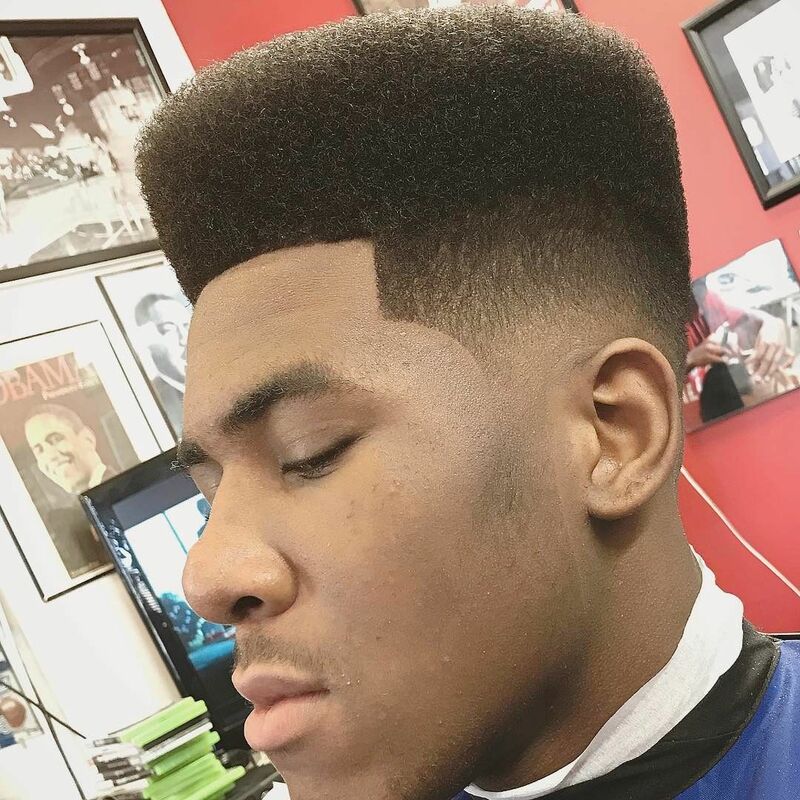 The flat top haircuts has gained new heights in recent times. One of the reason for this the new alterations and designs which has refreshed the classic haircut. 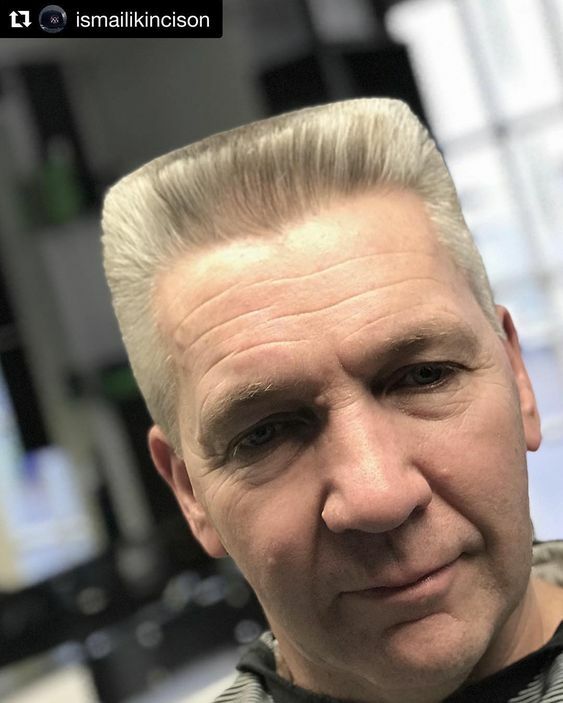 Although most die-hard 90’s fan still stick to the classic flat top haircuts, regardless, a few of us who appreciate a little bit less edginess, can step it down a notch. Depending on what style you choose to go with, a flat top can serve for both formal and informal appearances. In general they are also very easy to maintain, howbeit, one must consider the style of choice. The straight hair flat top haircuts as mentioned requires the use of products especially for those with non-straight hairs. Another important consideration is how skillful your barber is. Most of the flat top haircuts require a high level of skill to achieve such as the steps.Did you enjoy the article? Stay tuned as we are working to bring you more.